Dr. Ernie Ward answers ten compelling questions about canine dental care. Dogs are remarkable creatures. From the tip of their cold noses to the ends of their wagging tails, canine anatomy is as beautiful and graceful as it is unique and fascinating. The mouth, teeth and skull of dogs are incredibly well adapted to meet the needs of one of nature’s most perfectly designed scavengers. The oral cavity of the dog is also the source of many myths and misunderstandings that lead to some potentially serious problems. Here are some of the most common, interesting and important dental questions I’m regularly asked in my practice. The average adult dog has about a third more teeth than his human counterpart. 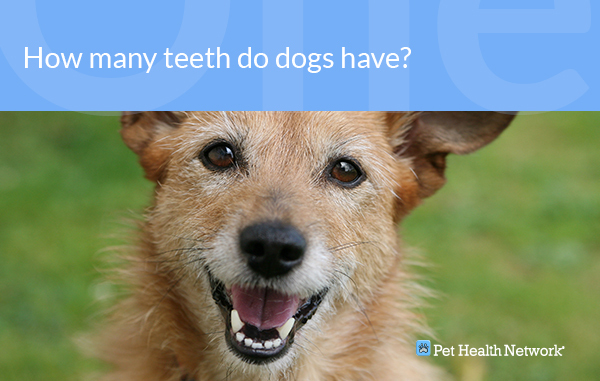 Adult dogs have 42 permanent teeth compared to a measly 32 average human teeth (not counting any wisdom teeth. Those are "bonus."). 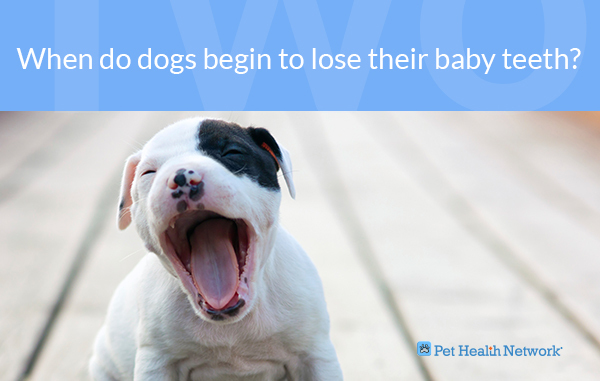 Puppies possess 28 baby teeth while human babies will have 20 deciduous or “baby” teeth. Once the adult teeth are in place by about 6 months, it’s anyone’s guess. I’ve known many veterinarians and dog lovers who claimed they could determine a dog’s age by gauging the amount of wear on the teeth. Maybe. What if a young dog chews on hard things? That could lead to a three-year old stray dog mistakenly being categorized as a senior dog on the basis of worn teeth, resulting in a lower chance of adoption. Not good. I believe this myth of aging dogs by their teeth started with horses. Horses’ teeth erupt over a five-year period ("full mouth at five"), wear at somewhat established rates and you can get a ballpark guess of the age of a horse by careful examination of teeth. The same isn’t true for man’s best friend. Or man. 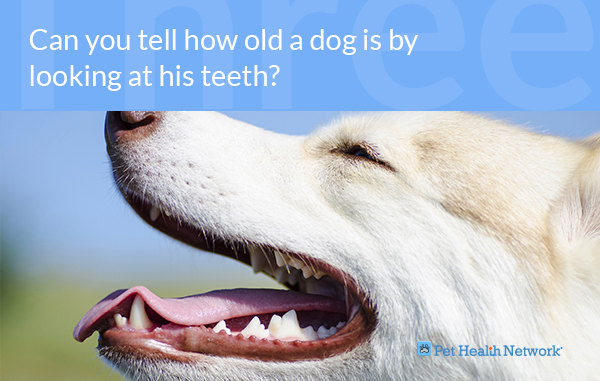 Guessing a dog’s age must include much more than simply the current state of his teeth. This is a common myth I’m asked about by many dog owners. 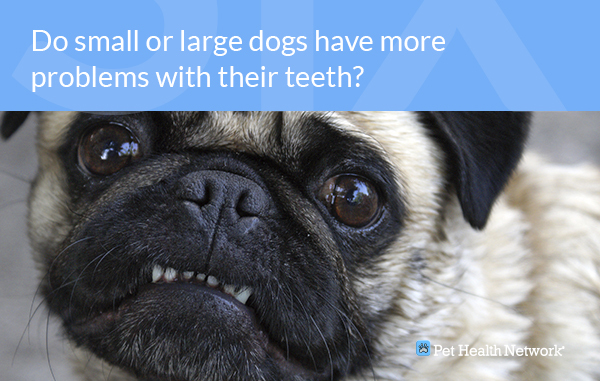 Unlike species such as sharks, dogs can’t regrow lost or damaged teeth. 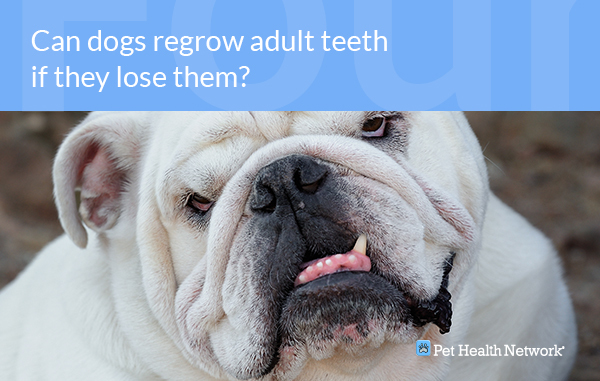 If they lose an adult tooth, they lose it forever, just as in humans. 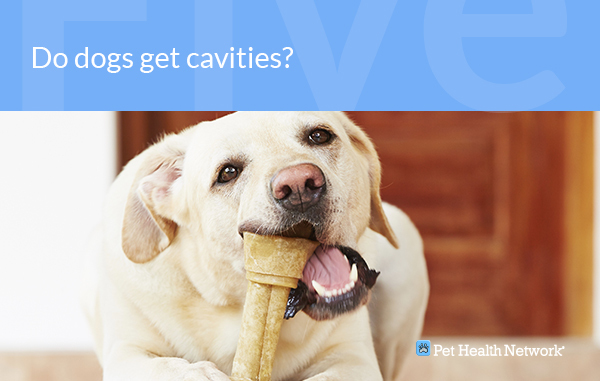 This is why it’s so important to take good care of your pets' teeth. They’ve got to last a lifetime. Conversely, I see absolutely no reason for a shark to have its teeth brushed. At least not by me. 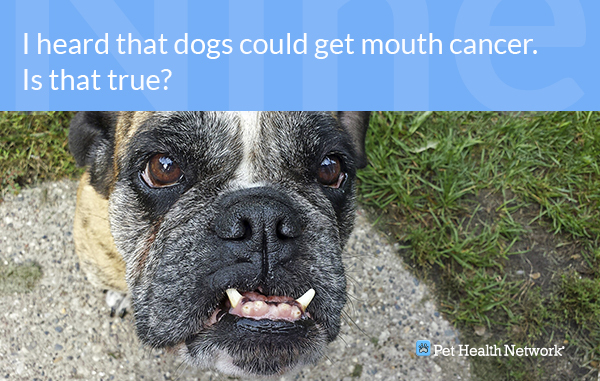 Dental caries or “cavities” as they’re more commonly known, are rare in dogs. This is due to many factors including a relatively low-sugar diet, differences in mouth bacteria, and the shape of the teeth. When cavities do occur, they can be treated the same way as human cavities: drill out the damaged part of the tooth and fill it with a special dental compound. In severe cases involving tooth root exposure, endodontic procedures will be performed such as root canal and capping. Extraction of the affected tooth is required in certain cases. 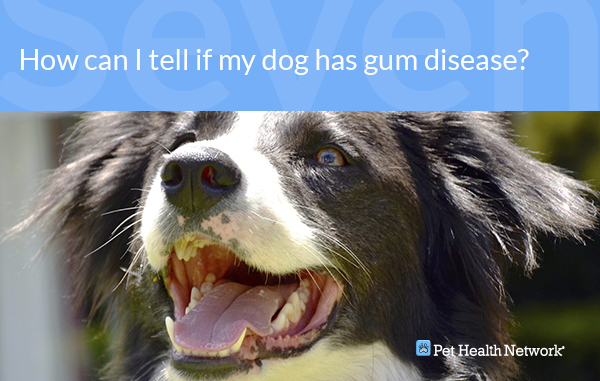 Another good reason to provide dental care for your dog. Start by lifting your dog’s lips. If you see dirty or discolored teeth, typically an ugly brownish-greenish color, see your veterinarian. This is likely tartar or plaque and is an early sign of imminent gum or periodontal disease. Next examine the gums for any swelling or redness. If you brush your fingertip along the gum line and observe the tissues become angry and inflamed or even bleed, this indicates more serious gum infection and disease. Finally, take a whiff. If your dog’s breath is fetid and foul, this is usually associated with bacterial infection. “Doggie breath” shouldn’t be a reason to avoid your dog. Remember that sweet smelling “puppy breath?” A dog with a healthy mouth should have pleasant or at least neutral odor. If your dog exhibits any of these signs, see your veterinarian for help. 8. 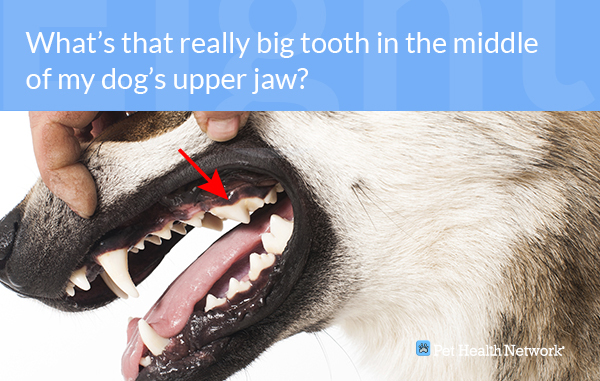 What’s that really big tooth in the middle of my dog’s upper jaw? Unfortunately oral tumors are diagnosed in many dogs. In fact, it’s estimated that one in four dogs will die of some form of cancer. Malignant oral tumors in dogs can be very aggressive and quickly spread throughout the body if untreated. If you observe any swelling, lumps, or dark and unusual colored tissue in your dog’s mouth, have it examined immediately. If diagnosed early, many oral cancers have a relatively good prognosis. You’re not alone. In fact, I’ve written many articles over the past ten years on how I personally struggle with this very basic procedure in my own pets. 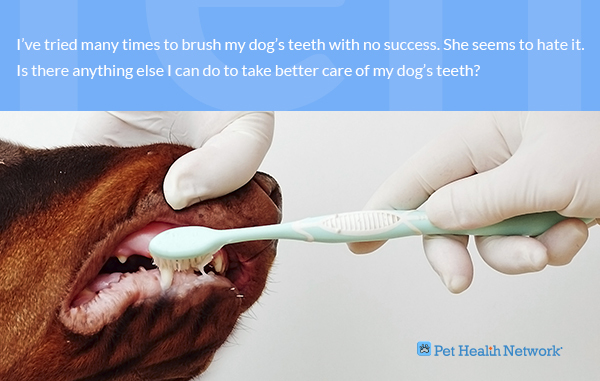 I don’t brush my dog’s teeth every day, either. So what do I do? First, I have all my pets’ teeth professionally cleaned under anesthesia once a year by one of my specially trained veterinary technicians. This is perhaps the single most important thing a pet parent can do for their pet when they can’t brush the teeth daily. While they’re under, I also take oral x-rays to make sure there are no hidden problems lurking out of sight underneath the gums. Next, I make sure to provide my dogs with chew treats approved by the Veterinary Oral Health Council (VOHC) to help remove plaque and tartar. Many have special ingredients embedded in them that help reduce harmful mouth bacteria. I regularly rinse both my dogs’ mouths with an antimicrobial rinse designed to kill pathogenic bacteria that can cause gum infection. This also helps leave their breath highly kissable. Finally, at least once a week I take a peek inside my dogs’ mouths to make sure everything looks, and smells, healthy. See, taking care of your dog's mouth isn’t so hard after all!